Let's Get Some Garlic in the Ground! | Gardens Alive! 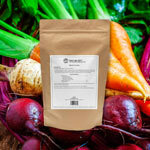 Root Crops Alive!™ - 3 lb. Q. You recently identified the scourge that had decimated my tomato plants as a soil-borne wilt; thank you! Now, I'm currently sorting my garlic harvest. Would it be okay to plant my new garlic where the wilted tomatoes were? I have SUCH a small plot of land to garden in. A. Most of us are severely space challenged, Kath. That's why rotating your tomatoes to different spots each year can be so challenging (but essential—as you discovered this season when you got hit by the "oops; looks like tomatoes DID grow in this spot last season after all" wilt). And I actually like to follow my tomatoes with a run of garlic. (One of the old adages of crop rotation is to follow roots with fruits and/or fruits with roots.) And I don't believe that your garlic will be affected by the (probably verticillium) wilt that felled your tomatoes, so I think that your plan is safe. But garlic can fall prey to its own diseases and develop neck rot, which is why I now rotate my garlic to a new bed every season as well as my tomatoes. (Let this be a warning to my fellow garlic lovers to 'keep moving' as well!) And this year, as further insurance against the loss of even a single bulb (I only lost about five of 200 heads, but each one was a personal tragedy—I just loves my garlic!) I plan to dig a big batch of soil-free mix into my garlic beds-to-be to improve the drainage. And I'll use a neat disease-fighting trick that my old magazine, ORGANIC GARDENING, revealed back in 2008: Mix one tablespoon each of baking soda and liquid seaweed fertilizer into a quart of water and let the cloves sit in the liquid for an hour or two before planting to impart some extra vigor and disease resistance to the cloves. I suggest that you and other garlic growers do the same: plant in different beds than your last garlic crop grew, lighten up the soil in that bed to improve the drainage, treat the bulbs with the baking soda and seaweed mix, and—of course—think good thoughts. A. Well, the basic answer is no—like fruit trees, asparagus, Spring bulbs and other plants with a chilling requirement, garlic really wants to be outdoors and in the ground. But a friend of mine with high hopes and a lot of youthful exuberance (which is now being drained by a delightful first child; congratulations Patrick and Helena!) did manage to figure out a way to get around the obstacles a few years back and show that it could be done if you put some work and thought into it. More importantly, September IS garlic planting time, so let's discuss both ways. The best way to plant garlic is, of course, right in the ground. Find a good local or mail order source of planting garlic (don't use regular supermarket garlic; it's treated with sprout inhibitors not to grow again), carefully pull the bulbs apart and plant individual cloves about six inches deep and six inches apart in your loosest richest soil. Mulching the bed with an inch or two of shredded leaves (NOT whole leaves; they MUST be shredded!) 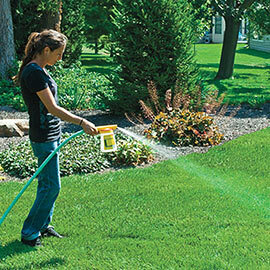 will protect the soil from heaving during roller coaster winters and prevent weeds—the bane of garlic growing. The garlic shoots can easily push through this leaf mulch, and might even appear later that Fall. It's fine if they do and fine if they wait for Spring. The important thing is to time your planting so that the cloves have a month or two to grow good strong roots before the soil freezes and the garlic goes dormant for the winter. Then hard neck or soft, you harvest your bulbs when the bottom third of the plants turns brown—which is typically late June through mid-July. To try and imitate this process in a pot, you'd select a nice big container that drains extremely well and fill it with ¾ of a soil free mix and ¼ compost. Don't use your Lousy Garden Soil, and don't put pebbles, peanuts, old pot shards or other junk in the bottom. Plant your cloves—don't crowd them or you'll get puny bulbs—water lightly, and then either leave the pot sit outside until frost or just leave it anywhere at room temperature indoors. Save your pitiful windowsill for killing houseplants; the underground cloves don't need sun at this point (not like the windowsill mentioned gets any)—just a warm environment and occasional light watering. But when winter arrives, you'll have to be prepared to chill the set up. I recall that Patrick did this by dragging the pot down to the coldest part of the house near a drafty back door. If you have a big beer fridge with enough room, you could slide it in there for the winter (the same thing you'd do if you were forcing Spring bulbs). But unless you live in the perfect climate (chilly nights that rarely kiss freezing in the winter, like some of our more Southern listeners do experience) you can NOT just let the pot sit outside all winter—a long hard freeze would kill the above-the-ground cloves. 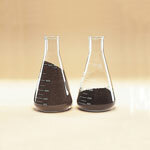 The cloves must get a good chill; three or four months at 35 to 45° F, but must be protected from freezing. And watering during this time must be very light; waterlogged bulbs will rot. Then get the container into bright light beginning in March. From this point on, the plants must get as much sun as possible—and the vast majority of windows are not up to the job. Now if you think you have a real winner of a window—East facing and all-day sun (or, even better, a greenhouse type bay window)—place the container there, turning it occasionally. Harvest as described above—when the bottom third of the greenery turns brown—and tell us how it worked!